Well, we had a great long weekend. It was so nice seeing family, having a date night and eating good food. I especially love the quality time we get with Izzy when there is no work and we can just focus on her. My husband and I both work from home. He goes into the office a couple days a week, but when your work is home with you it’s hard to completely turn it off. On the weekends we free ourselves mentally and it’s a beautiful thing. This year we didn’t do fireworks again with Izzy. For one, I really don’t like keeping her up past her bedtime and she doesn’t either. I also just felt in my gut she would cry with the fireworks. I want it to be a positive experience when we introduce her. Next year I can show her videos and explain them to her ahead of time. 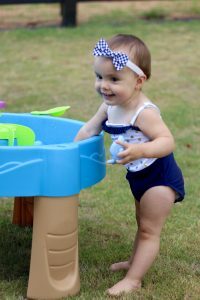 Water play is always fun for Izzy. It has been so hot I try to get her outside first thing in the morning and in the shade. 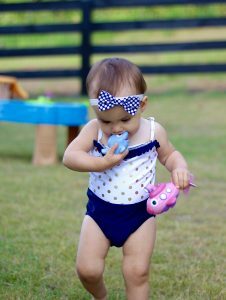 She keeps busy in the water with her Nuby Little Squirts Bath Toys, which are obviously great for more than just the bath. Izzy also thinks they are awesome for chewing too. You may have seen these on the bedtime routine post. 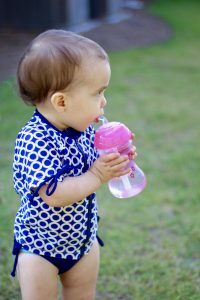 We kept Izzy hydrated with her Nuby Designer Series FlexStraw sippy cup. This cup has an easy grip base, which is perfect for her little hands. I love the fact it’s a straw cup! Why? did you know sucking through a straw builds important muscles in the mouth for speech? 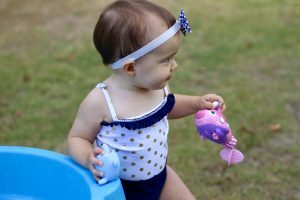 Her favorite new water toy right now really is the Nuby Little Submarine. They come in a couple colors and when you pull the propeller string the toy glides through the water. We are really into cause and effect toys right now! 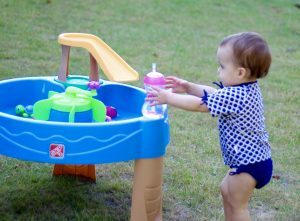 Who says a mommy can’t play in the sprinkler and at the water table too? 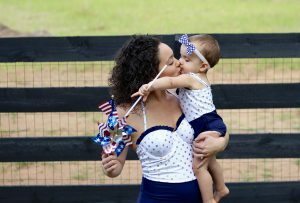 I pretty much feel like we must always wear mommy and me now. What do you think? I’m obsessed with these matching swim suits from RadSwim. Hope you all had a safe and fun long weekend! Love everything! The suits, the toys, that adorable little face! 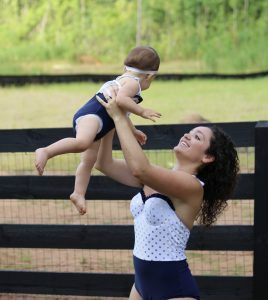 I can’t get over how perfect the Mommy and me swimsuits are! You guys. Such the cute team! Thank you Shannan! She is my little bud! Love it. 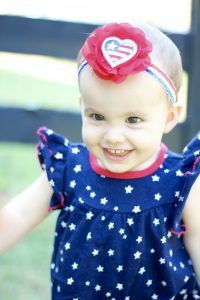 Great post with adorable pictures. 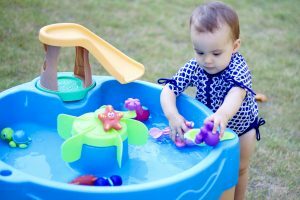 So many fun things to do with water when it’s so nice and warm outside. I honestly don’t think either of you should ever wear anything but those bathing suits!!! SO adorable. 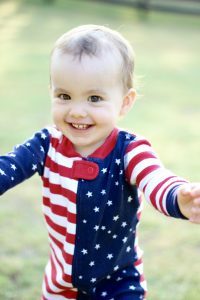 and her little Jammies!!! I love everything about this and am so happy you guys had such a wonderful holiday weekend. What a fabulous weekend! So glad you had warm weather and lots of fun with Izzy! Those suits are the best!!! !